Like Healthcare, Social Care Should Be Coordinated Too. Here Are Four Proposals. An excellent ST commentary by a Singaporean medical doctor based in Thailand – “Why does one patient see so many doctors?” (ST, Oct. 27) – made the important observation that healthcare in Singapore should be more coordinated. And especially so, in the context of an ageing population, and as more Singaporeans are likely to be affected by dissimilar chronic non-communicable diseases. “Coordinated care is more efficient and leads to better outcomes and cost-effectiveness”, Dr. Orland Goh wrote. “It leads to less duplication of history-taking and investigations, unnecessary administrative work and preventable admissions”. This importance of coordination applies to the social service sector too: Why do beneficiaries see so many social workers or social service organisations and government agencies to access different programmes and services? In fact, it could be argued that social care is even more complex, and therefore renders coordination even more critical. In healthcare, for instance, doctors observe and examine patients to provide diagnoses. In social care, healthcare is but one of many needs that social workers have to attend to. The other needs of their beneficiaries can be psychological, social, and emotional, and consequently the attempts by the social worker to ascertain their overall well-being can be challenging. And whereas healthcare – and its remedies – is oftentimes focused on the well-being of the individual per se, those receiving social care are part of family and social networks, which means interventions must also take into account more actors and factors. In what I previously described as a holistic need- or beneficiary-centric approach, the question for social scare shifts from “What can an organisation do, for this person or family?”, to “What can we do, collectively, for this person or family?” Non-profit organisations in Singapore are very wedded to their existing programmes and services – which is somewhat justified, given the professional expertise built up, the familiarity with implementation, and the histories or legacies – yet this attachment potentially limits coordination, because as a starting point each organisation emphasises what it can do, rather than starting from the increasingly complex needs of the beneficiaries (further complicated, as aforementioned, by their circumstances). Guided by research, what is instead needed is a better understanding of the various populations of those in-need. Take at-risk youths as an example. The sector should first define “at-risk”, establish the number of youths who may be considered “at-risk”, before ascertaining the risk and resilience factors associated with the group: To what extent does family structure or dynamics matter? Are school- or community-based interventions more effective? And what are their longer-term education and employment prospects, especially if they have completed a social service programme or service? This is an iterative process focusing squarely on the beneficiary. Needs analysis is contingent upon whether good data is available, but too many case records and documents remain kept as hard copies. The initial move to digital records will be painful, the processing of historical records will take substantial time and effort, and over-burdened social workers may find it difficult to – in the short-term – manage the new administrative tasks. Yet beyond the organisational or sectoral benefits of collaborative data analysis, as the organisation evaluates its programmes and services more efficiently and as the sector develops new knowledge about whom it works with and for, the beneficiaries too could be spared the hassle of repeatedly providing demographic or socio-economic information about themselves to different agencies. Central to this are long-term investments in capacity-building: Researchers, data analysts or engineers, and organisational managers. And for this to transpire, funders must be convinced to look beyond their conventional predilection to only directly fund programmes and services. 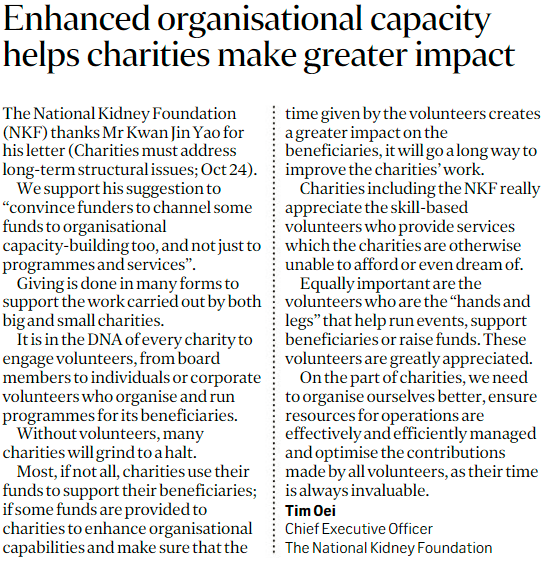 CEO of the National Kidney Foundation Tim Oei, replying to my piece last week, affirmed the benefits for such funding. Most charities and non-profits do a good job of reporting output numbers. Their social workers are cognisant of the number of beneficiaries they serve, the number of sessions conducted, and – for some of the more progressive organisations – the results of pre-post analyses; that is, short-term measures on whether the beneficiaries have made some gains. Moving ahead, from an evidence-based perspective, organisations should work to evaluate the effectiveness of their programmes and services. This does not, at least for the time being, necessarily mean a randomised controlled trial (RCT) or even a quasi-experiment approximating an RCT, but rather working within the sector to develop more objective measures of how their beneficiaries are doing; that is, their long-term outcomes. Well-positioned intermediaries are instrumental for coordination. They connect organisations which are working with similar beneficiaries or needs, connect organisations with funders, and – increasingly – connect research perspectives in these relationships. Thus far in Singapore, intermediaries have begun to organise networking or get-together sessions, and have also been publishing exploratory studies in broad fields or topics, though it is not clear, respectively, if they translate into tangible partnerships or actionable insights for the sector. Just as charities and non-profits rigorously evaluate their programmes and services, intermediaries need to progressively establish benchmarks against which their performance can be judged too. Otherwise, their contributions to the sector may remain unclear.